“Choosing to step outside the boundaries of social acceptability” says the ICA’s publicity, it is a huge understatement and although there is no claim of a “first”, this exhibition must surely be one of the first public showings of many of these works by artists such as Tom of Finland, Cary Kwok, Mike Kuchar and Antonio Lopez, who portrayed male sexuality in the raw and - in the case of Tom of Finland - defined and inspired the whole leatherman subculture. Biographical details are provided but there’s very little explanation provided but not much provenance or context; there seems to be no catalogue or accompanying essay. Whilst is interesting to see these works in a prime London space at last, surely Sarah McCrory (curator) could have provided more context and explanation than the few words of the publicity handout. This mentions the high level of technical skill and outlines an interpretation based on gender politics and challenging of social conventions but fails to make the most of this opportunity to re-evaluate these works at just the moment they would be able to receive recognition outside specialist audiences. 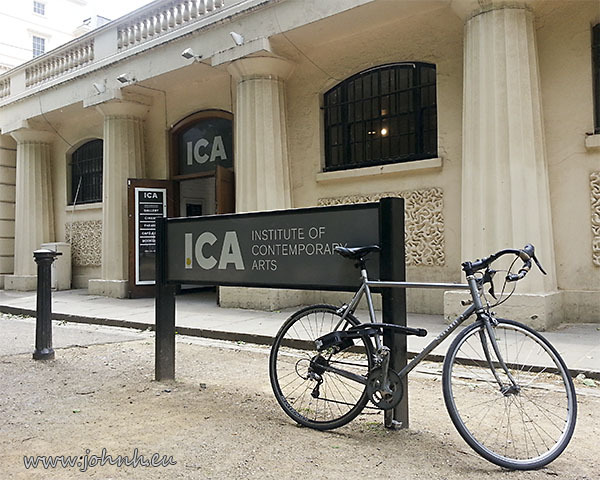 Keep Your Timber Limber (Works on Paper) continues at the at the ICA / Institute of Contemporary Arts throughout the summer. Free admission: worth checking out, even though there’s very little interpretation. The ICA has an OK coffee bar too! 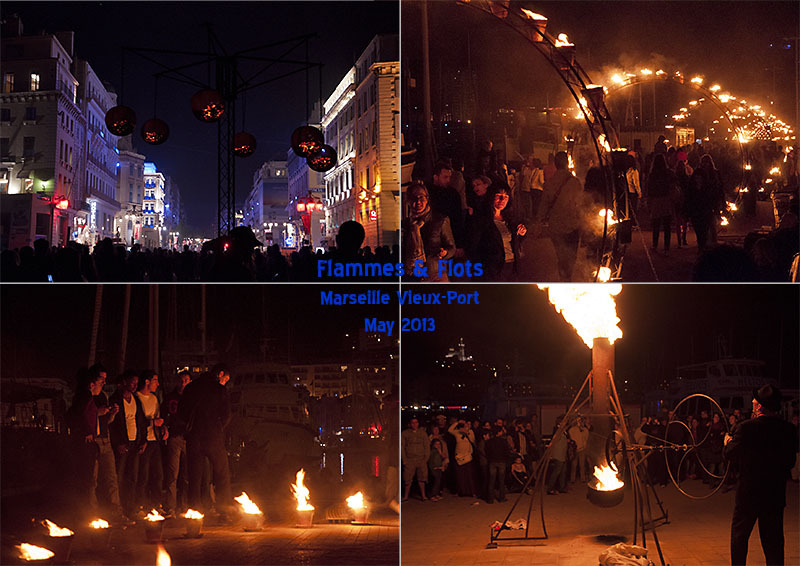 Fire in the Vieux Port at Marseille! An encounter with fire and an opportunity to reacquaint with the Old Port, thanks to the 2013 European City of Culture. Numerous displays, thousands of fire sources and yes, it did remind us of fire, the element, that most of us don’t usually encounter in daily life. The heat from the fire, the enticing but dangerous play of the flames and the smell of the smoke. Lots of circles (think “ring of fire”), big coal spherical braziers suspended on frames above the Canebière and radiating massive heat, and a spectacular tunnel of fire formed of hoops, each featuring a number of fire sources. There were some acrobats; mime artists and musicians but mostly the public were the performers. The risk assessment must have been formidable, both the fire risk from more than 4000 open flames with no particular separation from the public, also for personal security, as the street lights were switched off. There were plenty of marins-pompiers (firemen) in attendance plus there was a cordon of police around the whole display area; people joined in the spirit of the encounter and we didn’t see any incidents and none were reported in the press. So Marseille pulled it off, however it was cleared. Compare with Burning the Clocks in Brighton, no open flames at all! Light Show brings about thirty pieces created since the 1960s to London’s Hayward Gallery on the South Bank. 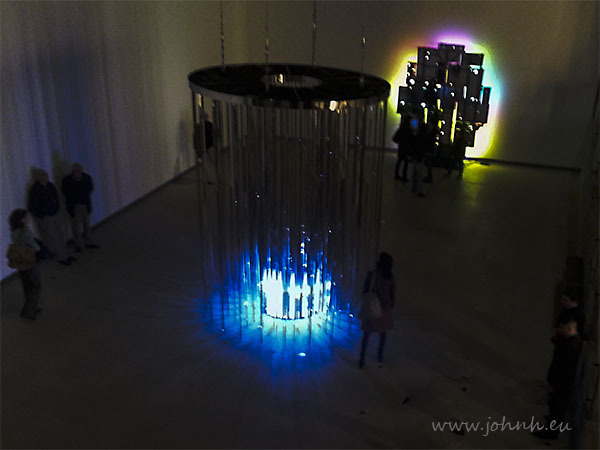 This show is fundamentally different from most exhibitions: the exhibits in Light Show emit light whereas most exhibitions are about objects which reflect light. We see red light plus green light as an attractive yellow, whereas red paint added to green paint makes something that looks like brown mud. My reaction to pieces varied from admiring beauty and aesthetic satisfaction to curiosity: “how did the artist do that” or “why do my eyes see it like this?” And a couple of “mmm.. yes” reactions too. Frescoes, mosaics with plenty of other artefacts at the Pompeii exhibition at the British Museum, including a gladiator graffito that I haven't seen before. The exhibition is laid out like a Roman villa with the finds on show in each room corresponding to the rooms in which the artefacts would have originated. This works really well as a grouping though makes progression through the exhibition a bit strained as this is inevitably a popular show. Three complete frescoes of entire walls are presented in a space similar to the original building in Pompeii, which gives a great sense of the geography and also makes sense of the mirroring of the imagery between the panels. Kelly Richardson’s latest video installations are the headline show: Legion is four video installations of nature settings which the artist has enhanced to give an other-world feel. The most eye-catching are a barren landscape with eerie (light blue) animated trees which move together in the wind before disappearing and regenerating in a seemingly random sequence. Although three of the four pieces aim for an immersive experience with large, projected displays and multi-channel sound, there’s a lack of development of the imagery and, once the shock of the unexpected has worn off, we found no particular emotional involvement or connection with the pieces. They are video but other than that, there’s not much apparent creative development since Roger Dean’s inspirational cover artwork in 1973 for “Tales from Topographic Oceans”, the album by Yes.